Did the delicious chicken casserole. Very good can you plse tell me for how long I need to make it in the slow cooker. Thanks for another fantastic recipe. The moment my husband tasted it, he said: “Mmm Mmm! 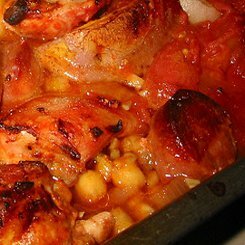 This must be Graham’s recipe!” I did’t have chick peas and as there was a lot of sauce, I thickened it with a rounded tablespoon of corn flour. I also made my own pork sausage with sage, salt and pepper and worcester sauce. Finally, I added fennel seed as I didn’t have a fennel bulb. Served it with rice. Wow! Fantastico! Hi Graham, assumed as much, did make it, very rustic dish. Loved the flavours!! Would love to try this, I see u mention pork sausages in the ingredients list but nowhere in the method. Could this be made in a slow cooker. I do not have a large enough oven?